When the software control panel is too limited, then the ATEM 1 M/E Broadcast Panel is a professional panel with the highest quality buttons, knobs and controls for the most demanding live 24/7 live production environment. The ATEM 1 M/E Broadcast Panel is compact so it fits within a rack width!. You get full control of your switcher, including cameras, transitions, keyers, fader, DVE control and more. ATEM 1 M/E Broadcast Panel connects via ethernet, and includes a loop thru connection for more than one panel or computer. Get the compact control panel that makes your live production faster! 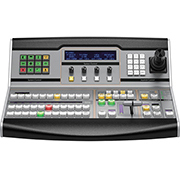 - Live production is easier and fun with an ATEM control panel! Select Sources - Switch camera to air instantly! Transition Styles - Transitions at the push of a button!